I can watch video of the 2011 Daytona Gatorade Duel forever. My brother, Brian, and I raced together that day, one of the few times we’ve ever raced together. Brian was in a low budget, underfunded car — the No. 92 — and I was running in the Deuce. Before the race started, we talked briefly. I told him I didn’t expect to be running in the same area of the race that he was, so I didn’t think I’d have an opportunity to help him. But if I did have a chance to help him, I would. In the closing stages of the race, I got spun out, and sure enough, for those final laps, I was actually behind Brian. I started pushing him. He followed exactly what we’d talked about, and the next thing he knew, he had qualified for the Daytona 500. This week, Brian and I are going to be driving together again. He’s going to take the wheel of the No. 29 on my truck team at Talladega Motor Speedway. As happy as I am to be reunited on the track with my brother, the circumstances that led to him driving for me could have been better. Austin Theriault, a great young talent and the regular driver of the No. 29, was injured two weeks ago at Las Vegas Motor Speedway. It was an unfortunate incident that saw Austin get hit by his teammate, Tyler Reddick, in the right rear quarter panel as he came off a corner. Austin crashed into the track wall head-on in a spot where there wasn’t a SAFER barrier. The impact was dramatic, and he took a hell of hit. The front of the truck collapsed, driving the steering wheel into Austin’s face and breaking his helmet, and he also took a shot to the lower back. A helicopter had to airlift Austin to a hospital for examination. We’re all extremely happy that he wasn’t hurt much worse, and I’m looking forward to seeing Austin back behind the wheel in a few weeks once he’s recovered. He’s a super professional driver and an all-around nice kid. That’s a great privilege to have. One of the questions I’m asked the most on social media is why Brian and I don’t really work together much. The answer, as you might imagine, is a complicated one. Brian and I are different people. We’re opposite in every way. Just start with our builds: I’m a skinny tall guy, Brian’s kind of a stockier guy. We have different personalities. Brian is probably more extroverted than I am with strangers, and probably less apt for political correctness than even I am, which is really saying something. Monte Dutton, an older NASCAR writer, said that modern-day NASCAR drivers need to go to charm school. Brian probably wouldn’t pass charm school. He’s more of a throwback to what a NASCAR driver would have been 20 years ago. 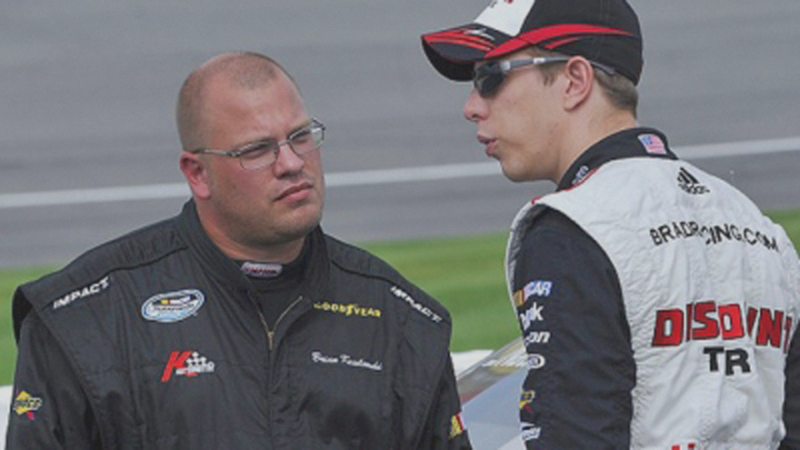 As a driver, Brian had some opportunities with ARCA car owners and lower level XFINITY owners earlier on, and for a bunch of different reasons, they just didn’t work out. He didn’t have the success he wanted to have. He still races from time to time at various levels — Late Model, ARCA, XFINITY and Cup. He’s worked as an instructor at one of Richard Petty’s driving schools, and more recently, has been a crew chief for the ARCA series. He’s a very good crew chief. One guy he’s been helping out this year, a young rookie driver, has been running up front and leading laps. He hasn’t won a race but he’s come really close. As far as my relationship with Brian goes, it’s kind of like I joked in one of my previous blogs: he’s the first person to defend me, and then probably the first person to offend me, too. He’s my senior by two and a half years, and we’ve had a contentious relationship at times. In his eyes, I’ll always be his little brother no matter what I do. Our paths haven’t necessarily crossed in a way where would have been able to do something like this before now. The BKR Truck Team is really a program for developing younger drivers, and Brian just turned 34 last month. And quite honestly, I’m not sure either of us was mature enough to deal with each other in a productive way earlier in our careers. But we’re trying now, and I’m glad we are. We’re in a positive place where we can help each other out. He wants to do it, and I want to do it. I’m excited by the idea of having him race for us. He gets to drive the truck that finished fourth at Daytona in the spring. I’m looking for him to have a safe day, first and foremost, and beyond that, to run up front, and make the most of the opportunity. He’s got a good team that could win the race, and he knows that, too. I’m excited to do something with my brother. There’s something about it that’s noble to me. My family started off working together. My dad and uncle built their race teams together. My brother and I have never really had that kind of relationship. It’s nice to be able to do something with him. The closest thing I’ve ever had like that with Brian actually came after that Daytona Gatorade Duel race in 2011. After we crossed the finish line and he had qualified for the Daytona 500, I climbed out of my car and walked over to his. I wanted to tell him what a good job he had done. When I got to his car, I found him inside, crying and emotional. At the time, I didn’t know what to say, so I just kind of let him be. We never really talked about it afterward, but I’m guessing he was pretty thankful for what we’d done together, and how the race had turned out. I know I was, too.